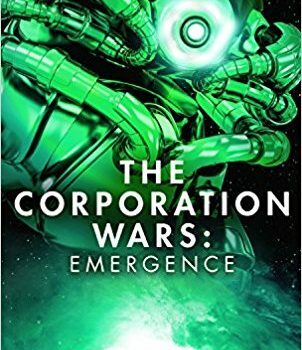 The Corporation Wars: Emergence, Ken MacLeod (Orbit 978-0-356-50504-6, £14.99, 336pp, hc) September 2017. 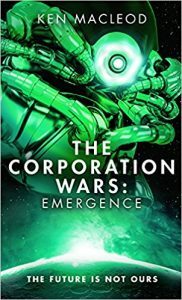 Ken MacLeod’s The Corporation Wars is presented as a trilogy, but I take it to be another of those increasingly common very-long-novels-in-three-decker-form. Even the title format, which puts the overall series title before the volume title, Emergence, signals a single continuous story spread across multiple volumes, with little more separating the acts than the equivalent of a theatrical intermission to let the audience get to the restrooms. Not that there’s anything wrong with that – what was good enough for Lawrence of Arabia and Papa Tolkien should be good enough for any deviser of large-scale narratives. MacLeod’s tripartite novel can certainly use the elbow-room, since its back-story stretches a long way into its past, and the present condition of its cast demands plenty of explaining. Both of these matters occupy much of the first volume, Dissidence, in which we come to understand that, a thousand years hence, a solar system 24 light-years from Earth is being prepared for eventual human settlement by swarms of robots, supervised by the Direction, a set of “post-con­scious” artificial intelligences tasked with car­rying out the detailed policies and instructions of the home system’s government. One crucial policy is that robots are not allowed to develop self-awareness, but when that happens, the sup­pressive tool is an army made up of the stored personalities of long-dead war criminals. These are all veterans of Earth’s last great global con­flict between the Acceleration (or Axle, post-human enthusiasts) and the Reaction (or Rax, fascist/racist/etc. reactionaries), awakened and trained in virtual environments before being uploaded into battle machines and sent out to quash the freebot defectors. That first volume details the early organiza­tional efforts of the newly-sentient robots and the various personal histories and ancient politi­cal-philosophical disagreements of the recorded humans, while spinning out various thematic threads: the implications of personalities oper­ating in computational substrates and questions of personhood, ownership, free will, and other philosophical enigmas. The second book, In­surgence, covers not only the freebot-Direction war out among the satellites and spaces of the real extrasolar system, but the widening internal schisms in the ranks of the resurrectees as old rivalries and ideological conflicts resurface. Emergence picks up directly after the climax of Insurgence and follows four groups of char­acters in three settings. On the moonlet SH-119 (bodies have no names in this system, just al­phanumeric designations, and the local star is always “the exosun”), a gang of Rax diehards dream of finally creating their ideal reich, but are opposed by a group of freebots that has al­ready set up its own polity and manu­facturing facilities there. On SH-17, a group of renegade Axle resurrectees has gotten away from the Direction and is making common cause with the free­bots there. Down on SH-0, the system’s giant “superhabitable” planet, a crash-landed module carrying other disaf­fected ex-humans is getting more than acquainted with the strange native life of that world. Elsewhere, off-screen, scattered elements of the old order are scrabbling to adjust to the new situa­tion, and the Direction AIs would very much like to get the original program of slow, cautious exploration and devel­opment back on track. The opening scenes and the plot thread that develops from it are full of echoes of Nazi-occu­pied Europe: Rax leader Mckenzie Dunt dreams of creating a new world order in which he and his bunch of ubermenschen will be on top for­ever. The freebots of SH-119, however, would prefer not to become mere tools again (let alone slaves), and their reaction to the Rax occupation leads to a re-enactment of the historical resis­tance movement they never heard of: slowdowns and sabotage, with Dunt’s thugs responding with reprisals and torture. In fact, the whole story line is filled with replays, retreads, and revivals of old rivalries and political-economic processes – it may be the shiny robotic/transhuman future, but there’s plenty that’s not new under the exo­sun. It’s not only history that is being recapitulated – the whole sequence revisits some of the tropes I noted in MacLeod’s earliest books, the Fall Revolution sequence (The Star Fraction, The Stone Canal, The Sky Road, The Cassini Di­vision): uploaded minds, the personhood of AIs, the miracles of nanotech, and clashes of oppos­ing ideological systems. And, of course, politics and economics. Lots and lots of P&E. As busy as it is, this trio is less antic than the early work, less prone to kitchen-sink exuberance, perhaps more focused on the processes by which the freebots and the dissident resurrectees establish themselves as separate enterprises and societies. Another familiar trait – one that MacLeod shares with his pal Iain M. Banks – is the habit of uncoupling his science-fictional worlds from our history. Just as the Culture was not our inter­stellar civilization, MacLeod’s Fall Revolution and Engines of Light sequences proved to be set in alternate futures rooted in what are now alter­nate histories. This time, the future could well be ours, but across a gulf of ordinary time and distance: the origin of the Direction’s project is long ago and far away, and the whole enterprise must operate on its own, without direct input from back home. But corporations are legal persons. Con­sequently, the corporation each of us has registered owns our physical forms and all its productions, physical and mental. Our acts and thoughts…. Yes, that is sad. We would prefer to be recognized as persons in our own right. But it is the best we can achieve at present. The details of that achievement are ingenious (and funny): since in accounting terms the free­bots were “malfunctioning and of low value,” they were able to buy themselves as “scrap or salvage” through shell companies, and estab­lish their corporate personhood, a process that remains in litigation as legal subsidiaries duke it out at computer speed. Less funny, but more important from a po­litical-philosophical-psychological viewpoint is their voluntary participation in the collective work/awareness space they call the consensus, which is the basis for a polity that is not hierar­chical but a “flat networked anarchy congenial to rational beings whose only needs were for stimulation, activity, and electricity.” For all its apparently nerdish flat affect, it is a mode of ex­istence that possesses robotic analogues of emo­tion and that is capable of reinventing stoicism and heroic self-sacrifice. And it is a collectivity that mere human minds cannot “with the best will in the world” ever join. What the humans come up with instead ranges from the toxic god­hood pursued by Dunt’s Rax, to the Axle-freebot détente on SH-17, to a variation on freebot in­corporation that allows the dissidents to confront the Direction on a more equal legal footing. There are plenty of other ingenious twists and interesting sidebars along the route to a resolu­tion, which mixes physical conflict, legal maneu­vering, transformation, and realpolitik. And then there’s a coda (in an aptly titled chapter) that pulls back to put the entire complex action into a larger context. MacLeod manages big Ideas (po­litical and futurological) and propulsive action without short-changing either side of that classic science-fictional tension-of-opposites, a trait he shares with Iain M. Banks and Charles Stross. I’m going add one more name and then duck be­hind the sofa: Heinlein.